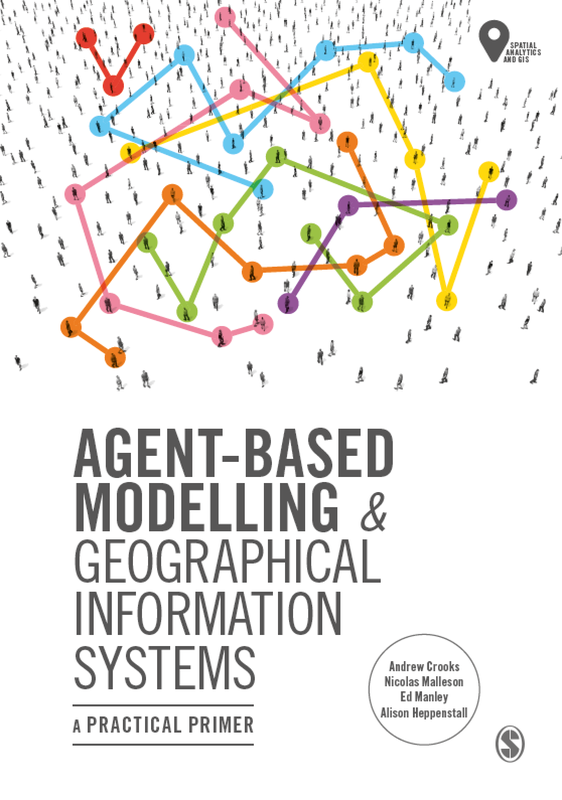 While many of the recent posts on the site have focused on social media, social networks and volunteered geographical information, we have not forgotten or moved away from agent-based modeling (as you can probably gather from the title of this post). 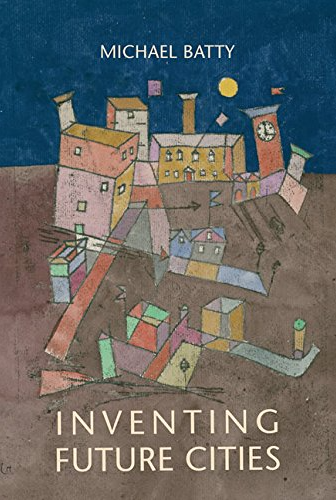 To this end, Ates Hailegiorgis, Claudio Cioff-Revilla and myself recently had a paper published in the Journal of Artificial Societies and Social Simulation entitled: An Agent-Based Model of Rural Household Adaptation to Climate Change. The purpose of the model is to explore how climate change could impact rural societies in less developed countries whose livelihoods rely on subsistence agriculture. It has been suggested that climate change will place unprecedented stress on rural communities, as it will alter their resource base without giving them sufficient time for adaptation. 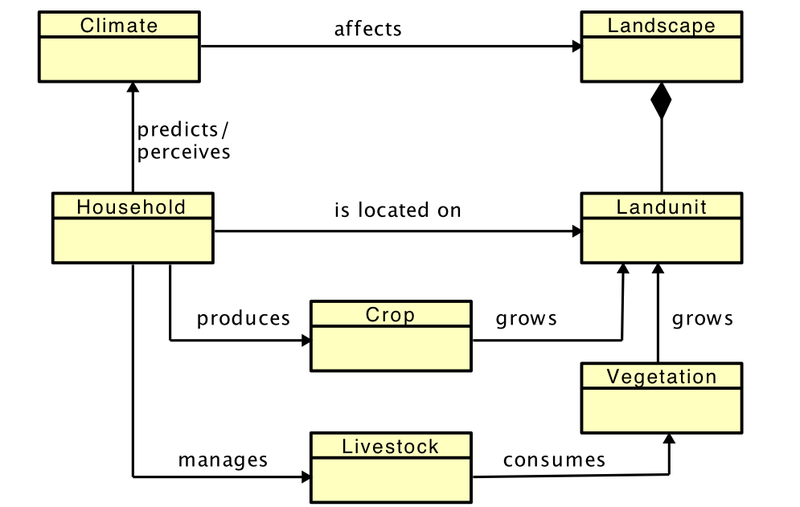 While rural systems have developed various adaptive strategies over many generations in order to survive, the alteration of any resources can significantly affect even highly regarded and accepted customs, and may lead to the displacement of populations along with other severe humanitarian consequences. 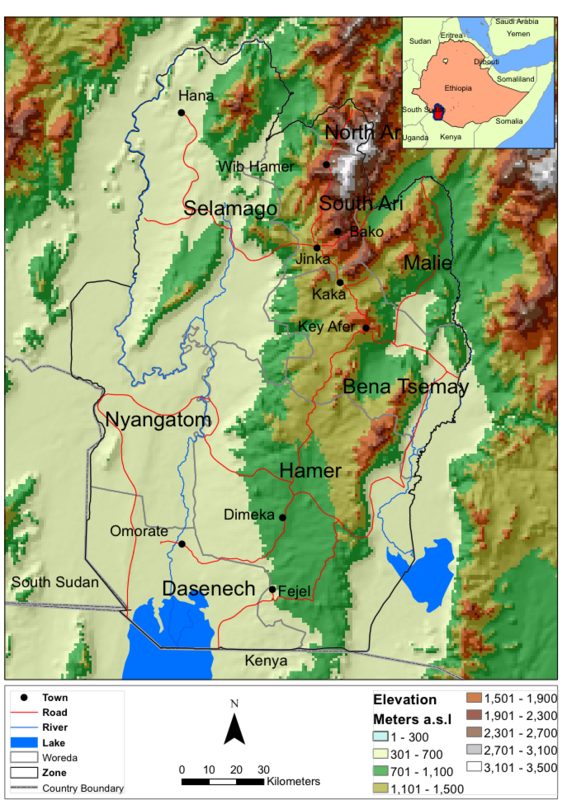 In this paper we focus on the South Omo Zone of Ethiopia which covers an area of 2.3 million hectares and is located in the southern part of Ethiopia. Climate change is expected to play a significant role in shaping the future socio-ecological setting of the region and to explore this we devlepd a model in the MASON simulation system, including its geographical information system (GIS) extension, GeoMASON called OMOLAND-CA (OMOLAND Climate Change Adaptation). Results from the model show that successive episodes of extreme events (e.g., droughts) can affect the adaptive capacity of households in the region, causing them to migrate from the region. While at the same time the rural communities manage to endure in spite of such harsh climatic change conditions. Below you can read the abstract of the paper, see some of the figures including the models high-level architecture, along with the household decision-making process, some results from various scenarios and a link to the model and the full reference of the paper. Future climate change is expected to have greater impacts on societies whose livelihoods rely on subsistence agricultural systems. Adaptation is essential for mitigating adverse effects of climate change, to sustain rural livelihoods, and ensure future food security. 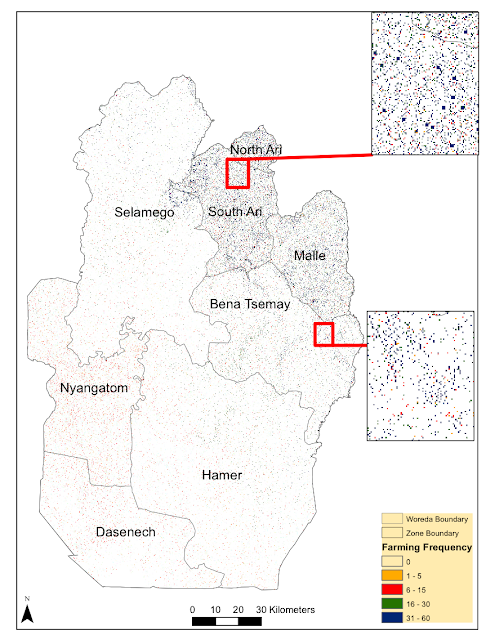 We present an agent-based model, called OMOLAND-CA, which explores the impact of climate change on the adaptive capacity of rural communities in the South Omo Zone of Ethiopia. The purpose of the model is to answer research questions on the resilience and adaptive capacity of rural households with respect to variations in climate, socioeconomic factors, and land-use at the local level. 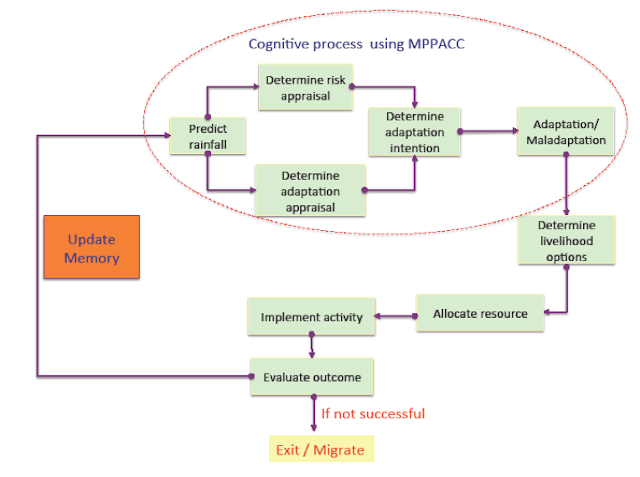 Our model explicitly represents the socio-cognitive behavior of rural households toward climate change and resource flows that prompt agents to diversify their production strategy under different climatic conditions. Results from the model show that successive episodes of extreme events (e.g., droughts) affect the adaptive capacity of households, causing them to migrate from the region. Nonetheless, rural communities in the South Omo Zone, and in the model, manage to endure in spite of such harsh climatic change conditions. 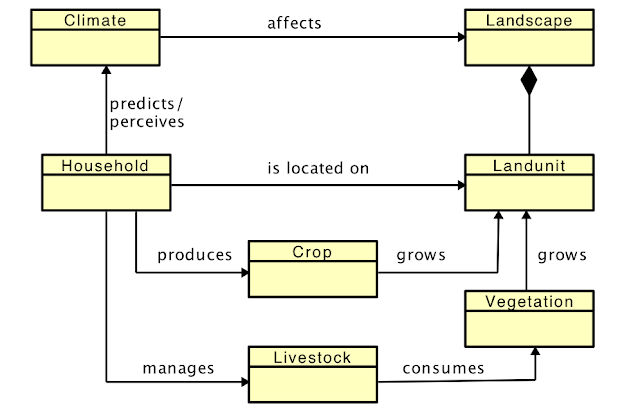 High-level architecture of the OMOLAND-CA model. Household decision-making sequence for each time period in the model. Population migration over time with different climatic conditions: a) 50% reduction, b) 70% reduction, c) 90% reduction of rainfall with different drought frequencies. Livestock growth over time with different climatic conditions: a) 50% reduction, b) 70% reduction, c) 90% reduction of rainfall with different drought frequencies. Simulation results of the frequency of crop planted per hectare. 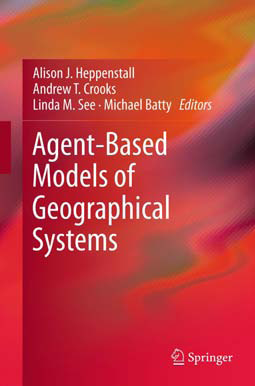 In keeping with many of our agent-based models that we have created, a full description of the model (using the Overview, Design concepts, and Details plus Decision (ODD+D) protocol), along with its source code and data needed to run the model can be found at: https://www.openabm.org/model/5734/ .